I’m a Senior Product & Design Leader who’s built & managed teams at LinkedIn, Yahoo!, and eBay. The consumer products my teams' build are used by hundreds of millions of people. At LinkedIn I led the Mobile UX team. Later I was the Group Design Manager for the Core Products team (Profile, Search, and Growth). I believe great products start with a thesis, touch people emotionally, and are validated with data. I care about advancing the art of product design. Prior to LinkedIn I was the Design Director for Yahoo! Search where I lead a team of 15 designers & prototypers who were responsible for the holistic search experience. Before Yahoo! I was a lead designer at eBay. I was also a founding Director of the Interaction Design Association (IxDA) and an alumni of the Human Computer Interaction program at Carnegie Mellon. At LinkedIn I led the mobile UX team, growing it from 1 to 12 designers. My team built award winning apps for iOS, Android, Tablet, & Mobile web. My goal is to understand each individual- motivations, strengths, weaknesses- and assess how I can add value. I make sure my team is always clear on goals, is thinking creatively and executing diligently. I encourage, challenge, support, and clear the way so they can do their best work. I run formal design critiques, while also establishing an open culture around feedback. I push my teams to think deeply about craft, and prioritize the right tools and environment to help them execute at their highest level. I enjoy finding and developing talent, and bringing together the right mix of people at the right time. This includes painting an inspiring picture, encouraging intelligent risk taking, and then getting out of their way. I've ensured execution & established product strategy. I have a strong business sense, a fluency with data and understand how to close, making decisions & learn quickly. Hiring a world class design team takes focus and effort. From rousing design talks at campus recruiting events, all the way to well-crafted onboarding programs, I am dedicated to building hiring processes that are efficient, effective, and a great experience for all involved. I strive to create an inspiring and productive environment, so we can all excel as individuals, but also win as a high functioning team. This includes spending quality time together, such as creative offsites and team meetings, as well as the small stuff that matters, like seating, tools, and equipment. Here are some of the key mobile products our team shipped during the formative years of LinkedIn’s mobile strategy. My role was to guide these design efforts, to help team members do great work, and to ensure a quality, members-first product. This second iteration of our flagship tablet app was redesigned & rebuilt to offer a new navigation model, a content stream and new features including search, jobs, channels, and influencers. We re-designed the phone application to focus on making a great reading experience and we succeeded with a lift of over 48% in stream page views and 64% in article page views. We also revised the navigation, and created a new visual language. The LinkedIn iPad app was designed to help business professionals start their day off right, with calendar integration, a dashboard of insights about their connections, and rich news and updates to help them learn and be better at what they do everyday. 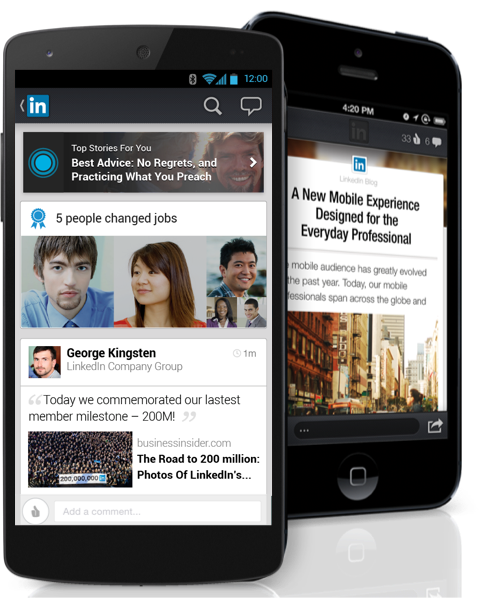 The re-imagined Linkedin flagship app sought to greatly simplify the experience with a new navigation model and a clear IA. The app’s center stage was a daily stream of professional updates designed to engage and inform.